All three types come with a protective peel-sheet on two sides. Use with both metal and wood frames. 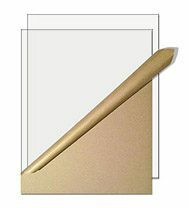 Click here for our line of matboard with windows. 8 x 10" .040" thick. Crystal-clear. 8 x 10" .040" thick. UV-blocking. Protect your framed work from 80-85% of ultraviolet rays! Each sheet comes with a protective peel sheet on two sides. Use for both metal and wood frames. 11 x 14" .040" thick. Crystal-clear. 11 x 14" .040" thick. UV-blocking. 12 x 16" .040" thick. Crystal-clear. 12 x 16" .040" thick. UV-blocking. 16 x 20" .040" thick. Crystal-clear. 16 x 20" .040" thick. UV-blocking. 18 x 24" .040" thick. Crystal-clear. 18 x 24" .040" thick. UV-blocking. 20 x 24" .040" thick. Crystal-clear. 20 x 24" .040" thick. UV-blocking. 24 x 30" .040" thick. Crystal-clear. 24 x 30" .040" thick. UV-blocking. 8 x 10" .093" thick. Crystal-clear. 8 x 10" .093" thick. 11 x 14" .093" thick. Crystal-clear. 11 x 14" .093" thick. 12 x 16" .093" thick. Crystal-clear. 12 x 16" .093" thick. 12 x 18" .093" thick. Crystal-clear. 12 x 18" .093" thick. 16 x 20" .093" thick. Crystal-clear. 16 x 20" .093" thick. 18 x 24" .093" thick. Crystal-clear. 18 x 24" .093" thick. 20 x 24" .093" thick. Crystal-clear. 20 x 24" .093" thick. 24 x 30" .093" thick. Crystal-clear. 24 x 30" .093" thick. Acrylic Front Sheet for Framing UV-Blocking. 8 x 10" .093" thick. UV-blocking. Protect your framed work from 98% of ultraviolet rays! 11 x 14" .093" thick. UV-blocking. 12 x 16" .093" thick. UV-blocking. 12 x 18" .093" thick. UV-blocking. 16 x 20" .093" thick. UV-blocking. 18 x 24" .093" thick. UV-blocking. 20 x 24" .093" thick. UV-blocking. 24 x 30" .093" thick. UV-blocking.